Wing: area: 0.34 m², span: 1.15 m, root thickness: 22 mm (min.). Fuselage Cross Section: height: 175 mm, width: 85 mm, area: 100 cm² - all measurements taken at the same location (min.). Weight: 2.2 kg ... 3.0 kg. Engine: 6.6 cm³ (max. ), has to be fully cowled, except 10 mm of cylinder head. Fuel: 80% methanol, 20% castor oil. Spinner: 25 mm diameter (min.). Landing gear: wheel diameter: 57 mm, width: 12 mm over 1/3 of diameter (min. ), fixed or retractable. 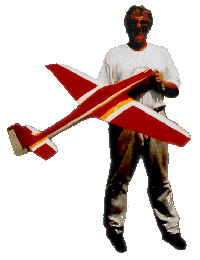 Manfred Pick with his «Dago Red Innovation» (MH 24 airfoil, IR engine), as seen in Karbach. 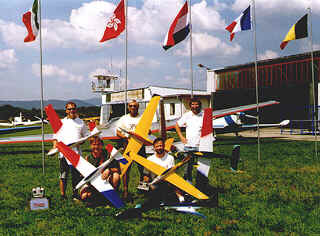 This is a typical F3D pylon racing model. Mr. Smoothie, who has been quite successful in Germany, is a design of Andreas Brenneisen. The upright engine installation makes engine startup and service work very comfortable. The required minimum cross section is located behind the wing. For simplicity he features a sturdy, fixed, landing gear. The vertical fin is quite small, but the high fuselage has a stabilizing effect. An incarnation of Mr. Smoothy, probably a crossover between a green alien and a pink flamingo, named «Mustang Crusher», as flown by Otto Jakob. Note the interesting leading edge shape! The prescribed model for the German beginner B-class: Quickie 500. Modifications are allowed only for engine and airfoils, but not for the model geometry. This model is used with a front intake, side exhaust engine, like the Nelson 40Q500. This F3D pylon racing model resembles a P-51D Mustang. It has been designed by Otto Jakob and was one of the first models made completely of composite materials.The retractable landing gear reduces the drag considerably. The installation of the exhaust system is rather complex: tuned pipe and muffler are routed diagonally through the fuselage to the exit at the rear of the canopy. as shown in the three view drawing above. Another Mustang (Miss R.J.) has been designed by the Malina brothers. 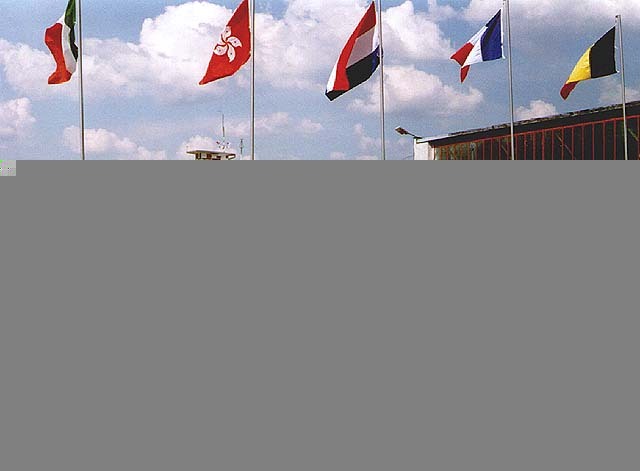 With this design, they won the 1985 world championships. A plan of the model had been published in the Czechoslovakian model magazine «modelár» in 1984 [larger image (82 kB)]. A nice Caudron C.460 from France. (if you look carefully, you can also identify two «Tsunamis»). A number 6 raptor, born in the jurassic Netherlands. The «Dago Red Innovation» of Manfred Pick. The improved follow up model is available here. see also: some kits of F3D models.